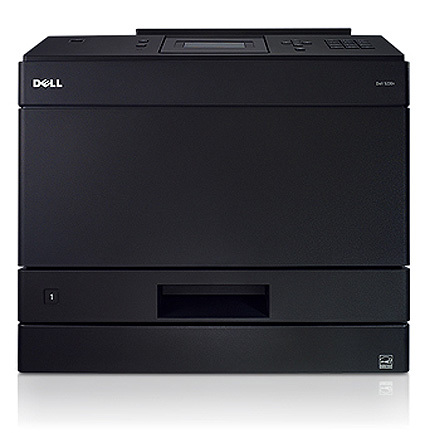 The Dell 5230dn is marketed towards small/medium businesses that want a flexible printing solution. With the option to add additional paper trays, ramp up the memory, and upgrade the toner - the 5230dn is perfect for growing businesses. With a monthly duty cycle of up to 200,000 pages and a print speed of up to 45 pages per minute, the Dell 5230dn has the credentials to handle busy office environments. The Dell 5230dn is best described as a black box – at its smallest the printer measures 16.7"(W)x 25.2" (D) x 15.8" (H), inches. It comes with a LCD panel and several functional keys which makes navigating the printer menus simple and easy. The Dell 5230dn has an extremely low cost per page output of 1p per A4 mono page printed. This makes the 5230dn extremely desirable for users who have high printing workloads, but want their printer to be cost efficient. The laser printer can churn out 45ppm – perfect if you have numerous devices connected. Print quality is equally as impressive – producing crisp, sharp prints. The Dell 5230dn could really benefit from WiFi. Although it comes with Ethernet, it's disappointing to see that you aren't able to connect mobile devices to the printer or support external devices that aren't connected to the company's network. The price tag is also fairly hefty, especially when you consider other models of a similar price include colour printing as well as additional functionalities such as scanner/fax machine.